to death on stage, blood staining his white shirt." Donald Trump, Jr asked via tweet, "I wonder how much of this 'art' is funded by taxpayers?" 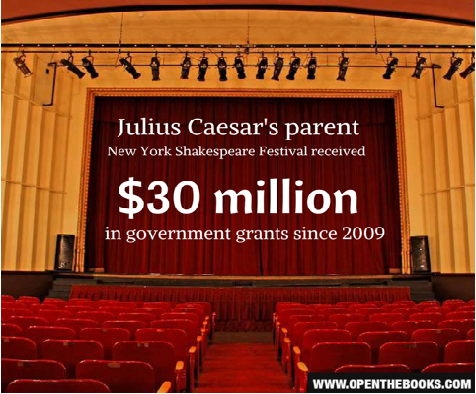 Today, our OpenTheBooks.com investigation answered Trump Jr: Since 2009, nearly $30 million in federal, state and city grants funded the New York Shakespeare Festival - the parent company to Public Theater and its production, Shakespeare in the Park. Read our editorial at Forbes and find out just which government entities at the federal, state and city level funded this 'non-profit' organization. By any estimation, NYSF is cashflow and asset-rich. Yet, the organization receives millions of dollars in taxpayer help. In the latest year of IRS disclosed data (ending 8/2015), the non-profit had financial assets of $53 million; saved $22.4 million in cash-on-hand and invested securities; received nearly $28 million in contributions - $106 million over the past five years; and earned total revenues of $40 million. Read our OpenTheBooks investigation published at Forbes, click here. Our organization just completed an audit of the National Foundation on Arts and Humanities (NFA-H). We found that taxpayer funding for controversial, 'non-profit,' asset-rich organizations is common. For example, the NFA-H gave $19.8 million in grants to 70 non-profits with assets greater than $1 billion in fiscal year 2016. We'll be releasing an oversight report based on our findings in the coming weeks. Please donate to OpenTheBooks today. It's a tax-deductible gift that holds the political class accountable - across America.